Baker picks new PGCPS board chair. UPPER MARLBORO, Md. — Prince George’s County Executive Rushern Baker III has appointed a new Board of Education chairman. Baker’s office nominated Dr. Segun Eubanks who was sworn in today Saturday afternoon as the new board chairman under a new state law that takes effect today (Saturday). It allows the county executive to choose the county school board chair. Eubanks is director of teacher quality for the National Education Association and is a parent of two Prince George’s students. Eubanks also served as chairman of Baker’s commission on education for the past year. He replaces board chair Verjeana Jacobs. In a statement, Baker thanked Jacobs for leading the board through difficult times. He says Eubanks brings an expertise in teacher quality and a vested interest in the schools, as a parent. Union corruption in PGCPS has been the biggest issue beside the Board membership. If he can fix the union problems and a few things identified in our blogs, everything else will work wonders. (See our Top priorities here). As a movement, we wish him well in the new assignment. Four appointees will join nine elected school board members. 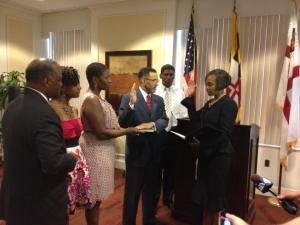 Pingback: Swearing in at the PG County Admin Bldg… | pgcps mess - Reform Sasscer without delay.